To keep your ID in great shape for all your identification, time, and attendance tracking needs, you want a badge holder that protects it from everyday wear and tear. With the sealable red stripe, this vertical badge holder offers both security and functionality. We use these to protect all our employees' id badges. They protect very well with the sealable top. When the holder gets too dirty to clean, we just replace it and do not have to make a new expensive ID card. These badges work well for employees with not so clean jobs - the badges protect from dirt and water. Nice, durable product worth the money. It's just a very good card holder that keeps the elements out and preserves the card better and longer. The ID holders will be used to protect IDs. The smaller quantity offered allows for having some replacements on hand especially for the smaller organization. This is a great product to hold Lifeguard Certifications on Fanny packs. We use this item to protect our door ID cards! Great product - really saved me a headache. Now I can have picture ID and key-fob together for people with no hassle. The holder is used to hold badges and that is it. ORDER LOTS OF EXTRAS AS YOUR STAFF WILL GO THRU THESE QUICKLY! We bought these for everyone in our center. We are adding a gift card and a bow for all the work done in 2010. These badge holders have been great to use with retractable badge holders...strong, durable. Ziploc enclosure is secure. Just what we were looking for. Seals moisture out, good capacity and durable! I like that they are more flexible than the previous ones we bought. Those tended to break in the cold Minnesota weather. These ID protectors are durable, roomy enough to accommodate both a badge and an electronic key card, and relatively inexpensive. I would buy them again in a heartbeat. These sealable pouches were exactly what we were looking for. Our employees liked the fact that they sealed as well as that they were lighter weight plastic and easier to handle. This Badge is excellent. This badge works perfectly with the employees Id and access card. Hold more than one card inside. The only think is that the badge is a little soft, but work just fine. We use photo ID badges. This is perfect to help keep the badges looking like new. Best Badge Holder for the price and long lasting doesn't get any better than this. Its Perfect. we use it for our ID' and Key card for Work. The protective id holders are used for our employees badges. They are worn by everyone and go through lots of wear and tear throughout the days. These holders have held up a lot better than anything we have had in the past. They ziploc which is great and hold in all the liscences and badges, etc. very happy with them. I like that this badge holder is sealable. No more lost ID badges because it fell out of the holder. It also lets the employee put in a key or other items they might need. Great badge holder that will keep your ID from scratching and water damage. We have tried a couple different types of badge holder sleeves and this one is of significantly higher quality than any others we have tried. Our associates have made it clear this is the only one we should stock. The product is used daily by our staff and it is an excellent product. Excellent Badge Holder and great price! Love these badge holders. They are much more durable than the previous holders from another company. 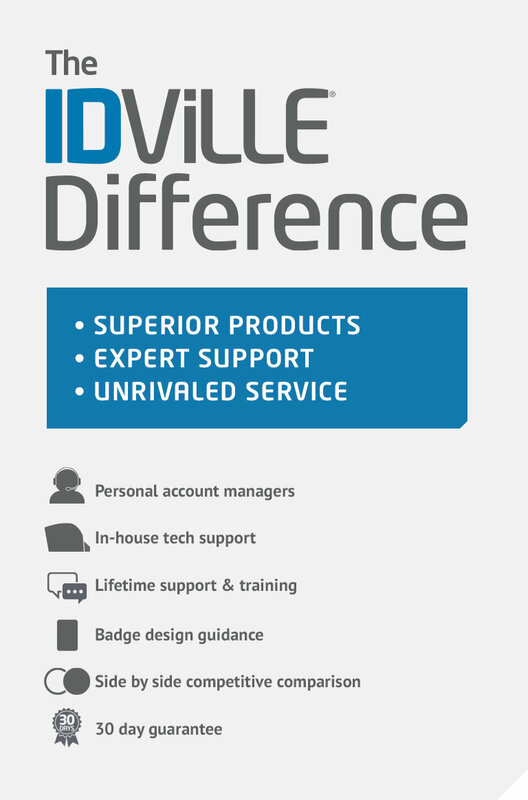 Plus, IDville is so easy to order from, provide EXCELLENT customer service and ships orders fast! We like the seal, however the badge easily tears on all four sides. My customers love these badge holders, it's easy for them to scan in and out at work. They use the badge holders with their company lanyards and have not complaints. Much better than our last badge holders! These are made of a high quality plastic that doesn't tear at the seams like the last holders we'd ordered. I also like it that the top zips closed so that badges don't accidentally fall out. We'll definately be purchasing these again! It protects the company badges. I put my employees' name badges and door badges in this pouch. The pouch keeps the name and door badges clean and professional looking. great badge holder for industrial work areas. has enough room for a badge and safety cards. employee's will use to hold the ID, NO complains so far from employees, like the products will see how durable is for the employees use ? Used to protect contractor IDs. Product is perfect for our needs. Good sturdy, a bit hard to open. These badge holders last longer than any that I have ordered in the past. The sealable ability is terrific for keeping the badges clean and dry. I would recommend to all.